KIAWAH ISLAND, S.C. — Another PGA Championship is in the books. What looked to be a tightly contested final round turned into an absolute rout, as Rory McIlroy pulled away from the field on the back-nine to win by eight shots. McIlroy, of course, came out the big winner this week. But he wasn't the only one making noise, good or bad, during the final major of 2012. Here's a look at the winners and losers from Kiawah Island's Ocean Course. 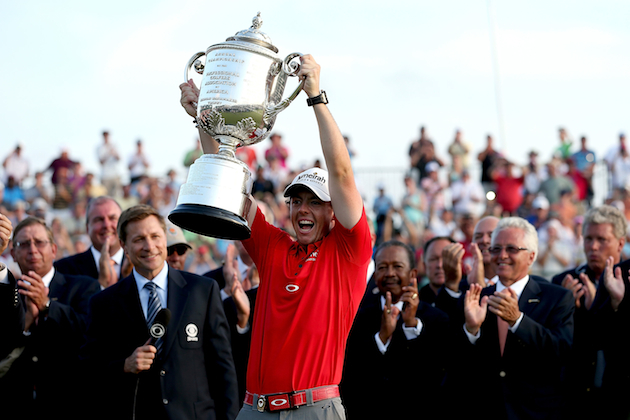 Rory McIlroy — Another year, another historic win. Seriously, what else can you say about Rory McIlroy? The 23-year-old was simply amazing over the weekend, recording 13 birdies and just two bogeys to win by eight shots, a PGA Championship record. Who held the PGA record before McIlroy, you ask? Jack Nicklaus. So, yeah, decent week for McIlroy. It was so decent, in fact, that when he was asked what he'd improve swing-wise from the week, he responded with: "Nothing." His final round was about as flawless as they come. David Lynn — If not for McIlroy's win, Lynn would be getting some serious play. The Englishman managed to fire weekend rounds of 68-68 to finish runner-up. If you're wondering why a guy who finished eight shots back in second deserves a spot on the winner's list (Lynn was never really in contention at any point on Sunday), get this: Lynn was playing in his first major in nine years. How impressive is that? The finish also booked his place in the Masters next year which, you know, is kind of a big deal. Phil Mickelson — Mickelson ended the week T-36 and never got into contention during the final round, but his finish was good enough to lock up the eighth and final automatic Ryder Cup spot. Based on his play coming into the week, there was a chance Davis Love III could have left him off the team. However, after Sunday, he no longer has to worry about the potential dilemma. Mickelson can go ahead and make reservations for Chicago. Seung-Yul Noh — The 21-year-old made a statement on Sunday with a 7-under 65, the lowest round of the day, to go from 7-over to even par. The impressive final-round performance allowed Noh to move up 37 spots on the leaderboard and post his first top-25 finish at the PGA Championship. Not bad for a kid who's two years younger than Rory McIlroy. John Daly — Give John Daly a round of applause. The big guy didn't figure into the mix on the weekend, but he managed to do something Sunday on the back-nine that made everyone stand up and take notice. Daly went out in 1-over 37 during the final round and looked to be struggling with his swing, but over the course of the last nine holes, he put it all together, closing with four birdies in a seven-hole stretch to post his best finish in a major (T-18) since a T-27 at the 2009 British Open. Well done, JD. Tiger Woods — What else can you say other than that Woods was once again a huge disappointment on the weekend. For the fourth consecutive major, he failed to post an under-par round on the weekend, a troubling stat that would lead you to believe there's something going on upstairs. The putter disappeared and he was a non-factor on Sunday. After being a near-lock to win when he held at least a share of the 36-hole lead, the last few majors proves that Woods is human and has some swing issues -- putting and short game top the list -- that need to be fixed. Hunter Mahan — You could lump Rickie Fowler and Brandt Snedeker in with Mahan, but of the three vying for an automatic spot on the Ryder Cup team, the guy with the wraparound shades had the best chance to knock Phil Mickelson out of the last automatic spot on the team. Mahan not only failed to accomplish that goal during the week, he didn't even make the cut. With two wins this season, you'd think Mahan would be a lock. But with only one top 10 in his last 12 starts, his spot on the team is up in the air. Lee Westwood — Westwood remains the best player in the world without a major for at least another eight months after missing the cut at the PGA Championship. With a T-45 at the British Open and a poor finish in the last major of the year, there's no question he's going in the wrong direction. Now it's time to see if he can right himself and get back into contention at the majors next year. Kiawah Island — This spot on the list has more to do with the awful infrastructure on the island and less with the course. Players noted all week that Kiawah Island looked like a links-style course but certainly didn't play like one. That won't necessarily cause the PGA to pass on Kiawah in the future, but with the weather on Saturday and the soft conditions, there's a chance the Pete Dye design could get passed over for a more reliable venue in the future. Also, it reportedly took fans upwards of four-plus hours to leave the parking lot and get off the island following Saturday's rain-soaked round that ended up getting moved to Sunday morning. You can't have backups like that and expect to host another big tournament. Simply put, Kiawah Island is just too small to host a major championship. Local rules for the PGA Championship — Michael Hoey was DQ'd for not replacing his ball to the same buried lie in the sand. And yet, the PGA of America thought it was OK to play all bunkers as "sandy areas" for the week. You have to wonder who comes up with these ridiculous rules sometimes.